ePublishing Knowledge BaseePublishing Knowledge BaseePublishing Knowledge Base Creating and Managing Directories & Buyers GuidesHow do I edit an existing directory listing (back-end)? Open the Directory Listing Manager's Search Form. Enter the listing’s company name/listing name or the ID Number. Only the company name or the ID Number will call up search results. None of the other directory listing fields are indexed. Zoom: Enter the listing’s company name/listing name or the ID Number. Select the listing you want to edit. Zoom: Select the listing you want to edit. Edit the fields you'd like to update, and click Save. 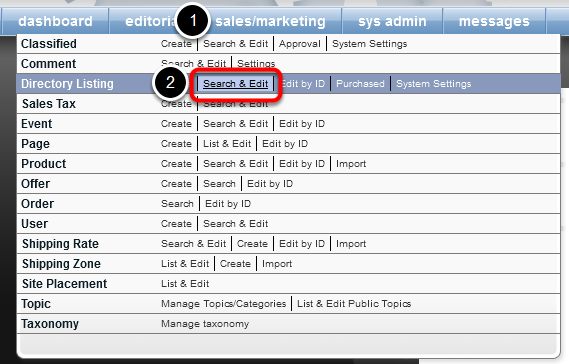 Learn more about editing a listing in this article: How do I create a new directory listing? Prev: How do I delete or hide a directory on my website? Next: What are the field validators for Directory API imports?